The aim of the paper was to study the effect of phosphodiesterase type-5 inhibitor, sildenafil citrate (SC), on uteroplacental perfusion. Fetal growth restriction (FGR) is the second common cause of perinatal morbidity. It is related to an increased risk of perinatal complication such as hypoxemia, low Apgar scores, and cord blood acidemia, with possible negative effects for neonatal outcome. The study was a randomized, double-blind, controlled trial. A total of 54 pregnant women whose pregnancy was complicated with FGR were divided into two groups. The first group received single dose of SC and the other received placebo. Doppler indices of umbilical, middle cerebral, uterine arteries were taken before and 2 h after medication administration. A total of 54 women yielded data for analysis. Of these, 27 women received SC and 27 received placebo. There was significant improvement of fetal Doppler indices by 66.7% among the SC group (P = 0.001) and insignificant changes in fetal Doppler indices among the placebo group (P = 0.06). Doppler velocimetry index values reflect decreased placental bed vascular resistance after sildenafil administration. SC can improve fetoplacental perfusion in pregnancies complicated by intrauterine growth restriction. It could be a potential therapeutic strategy to improve uteroplacental blood flow in pregnancies with FGR. During pregnancy, transport of nutrients from the mother to the fetus is predominantly dependent on uteroplacental blood flow, which increases considerably during the second and third trimesters of gestation ,. Fetal growth restriction (FGR) creates complications in 7–15% of pregnant women, and in its early and severe form, the risk of perinatal morbidity and mortality is increased . Because of the importance of placental blood flow to placental function and the recognition that placental size, uteroplacental blood flows, and expression of angiogenic and vasoactive factors are reduced or altered in compromised pregnancies, it has been suggested that therapeutic agents that target placental blood flow might be used to ameliorate FGR . Several new vasodilator drugs have recently been suggested to augment blood flow to tissues, and one of these drugs is sildenafil citrate (SC) (Viagra) . SC is a selective inhibitor of cyclic guanosine monophosphate formation through inhibition of type-5 phosphodiesterase (PDE5) . It increases uterine blood flow and potentiates estrogen-induced vasodilatation . Several studies postulated that SC may offer a potential therapeutic strategy to improve uteroplacental blood flow in FGR pregnancies [6–8]. It has been hypothesized that the PDE5 inhibitor may be useful in the treatment of hypertension during pregnancy as well as FGR. Sildenafil improves endothelial function of myometrial vessels in women whose pregnancies are complicated by FGR and induces vasodilation of chorionic plate arteries in women with normal pregnancies . The study was approved by the ethics committee at College of Medicine, Menofiya University Hospital, which is a large tertiary center in the Delta region in Egypt. Patients who attended outpatient clinic, presented in the emergency room, or those referred to our hospital from other places and fulfilled the inclusion criteria were offered to participate in the study after full explanation regarding study design and possibly expected benefits. Those who agreed had to sign a special consent form. The study was conducted as a randomized, double-blind, placebo-controlled trial, and recruitment of cases started in September 2013 and ended in June 2015. Study participants were randomized into one of two treatment regimens (SC or placebo) and were followed up over a 2 h period. The primary end point of the trial was improvement of the Doppler indices following treatment. Inclusion criteria included any age and any party, BMI between 25 and 35, singleton pregnancy, and gestational age (GA) of 24 weeks and more. GA was established based on menstrual dates and confirmed by first or second trimester ultrasound (US) for booked patients; however, if there is a difference of more than 7 days or more than 10 days during first or second trimester, respectively, then US value was used. For unbooked patients, they still had the chance to be included in our study if they could bring a scan that showed GA during the same period as mentioned before, had idiopathic FGR, had FGR owing to maternal malnutrition, maternal medical disorders such as anemia, pregnancy-induced hypertension, or chronic renal disease, or had FGR owing to substance abuse (including smoking), with or without past history of FGR. FGR was defined as one or more of the following: fetal abdominal circumference less than fifth centile, amniotic fluid index less than fifth centile, or Doppler umbilical artery (UA) pulsatility index (PI) greater than 95th centile . Only those who had abnormal Doppler indices were offered to be included in our study. FGR owing to fetal causes such as congenital abnormalities, fetal infection, multiple gestations, or any drug therapy that can affect fetal growth or fetal blood supply; maternal diseases that contraindicates the use of SC; or women taking medications that interact with sildenafil were the exclusion criteria. The enrolled patients underwent the following: complete history taking, complete clinical examination, maternal blood pressure (BP), maternal weight gain in pregnancy, laboratory investigations, complete blood count, liver function tests, renal function tests, serum uric acid, and any specific investigations if the case required. Fetal US biometric measurements included the following: head circumference, which was measured in the transthalamic plane; abdominal circumference, which was measured as a transverse section in the fetal abdomen at the level where the fetal stomach and the intrahepatic part of the umbilical vein (UV) the ductus venosus and gallbladder can be seen; head circumference/abdominal circumference ratio; and fetal Doppler indices measurement, which included uterine artery (UTA) Doppler indices, UA Doppler indices, and middle cerebral artery (MCA) Doppler indices. For umbilical vessels, the following indices were measured: systolic/diastolic (S/D) ratio, resistance index (RI), and PI. All three indices are highly correlated. PI shows a linear correlation with vascular resistance as opposed to both S/D ratio and RI, which show a parabolic relationship with increasing vascular resistance. Additionally, PI does not approach infinity when there are absent or reversed diastolic values. Abnormal UA Doppler indices were defined as S/D ratio greater than 3 and RI greater than 0.7, so all these pregnancies were the candidates of our study . For UTA and MCA, pulsatility indices were calculated. The cerebroplacental Doppler ratio (CPR), which is a ratio of the pulsatility indices of the MCA to the Doppler indices of the UA, was also calculated. This ratio is a better index for predicting adverse outcomes in FGR when compared with using either the UA Doppler values or the MCA values alone . An abnormal CPR was defined as a CPR of less than 1.08 . One physician (Dr Asmaa) was responsible for the clinical assessment and diagnosis of FGR. All study investigators, hospital staff, and patients were blinded as to which patients were given SC or placebo. Radiology staff was blinded also as to which patients received SC or placebo. Women were randomly allocated to sildenafil or placebo on a 1:1 ratio using a computer-generated random number list that was generated by the statistician who was independent of the treatment and radiology testing. An independent experienced radiologist checked all patients before and after treatment. The final analysis included only those patients who completed the Doppler studies after treatment with SC or placebo. Group I (SC group): this group consisted of 27 women who received single oral dose of 50 mg SC. Group II (placebo group): this group consisted of 27 women who received single oral dose of placebo. Medications had double-blinded criteria, with both sildenafil and placebo tablets having an identical appearance. All participants were evaluated by US once they were admitted and again after 2 h following administration of either of the treatment tablets. One sonographer was allocated to evaluate all mothers included in the study, using Philips Healthcare HD11XE, with an abdominal convex probe of C5–2 MHz. As no similar randomized studies addressed the hypothesis of our study, so the sample size calculation for our trial rendered 54 participants (27 participants in each group) based on 8% prevalence rate of FGR of all pregnancies with at least 80% power at two-sided 95% significance level, and the ratio of exposed / unexposed being 1:1. Analytical statistics, e.g., Student's t-test, Mann–Whitney test (nonparametric test), paired samples Wilcoxon's t-test, χ2-test, Fisher's exact test. P greater than 0.05 was considered statistically insignificant, P lower to 0.05 was considered statistically significant, and P lower to 0.001 was considered statistically highly significant. The study showed that there was no significant difference between the two groups regarding maternal age, BMI, GA, and maternal diseases as shown in [Table 1] and [Table 2]. A significant statistical difference was detected between all estimated Doppler indices before and 2 h following treatment among women in the sildenafil group as shown in [Table 3] (P = 0.001). There were no significant differences detected in all Doppler indices except for MCA RI and MCA PI before and 2 h following treatment among women in the placebo group as shown in [Table 4]. FGR affects ~5–8% of all pregnancies  and is associated with an increased risk of neonatal morbidity and mortality . The management of pregnancies complicated by FGR is currently limited to fetal surveillance, usually by Doppler US of fetoplacental circulation, to allow timing of delivery such that the pregnancy can be prolonged to gain maximum fetal maturity without exposing the fetus to an excessively adverse in utero environment . To test the hypothesis that sildenafil may improve uteroplacental blood flow, which can later improve fetal weight, we selected a group of pregnant women whose pregnancy was complicated by FGR and associated with abnormal uteroplacental Doppler indices. These women were divided in two groups: one received single dose (50 mg) of SC and other received placebo SC; they were given to these women to examine the uterine blood flow and fetal well-being indices before and 2 h after drug administration. In our study, there was no significant difference between the two groups according to the maternal age. Dastjerdi et al. , who studied the effect of a single dose of 50 mg sildenafil on uteroplacental perfusion in growth-restricted fetuses, showed that the mean age for women in the sildenafil group was 32.64 ± 1.5 years, whereas for women in the placebo group was 25.0 ± 0.2 years. In addition, Odibo et al. have reported a positive association between increasing maternal age and risk of FGR. However, von Dadelszen et al. , who tested the effect of 25 mg tid of sildenafil on pregnant women whose pregnancy was complicated by intrauterine growth restriction (IUGR) to improve the perinatal outcome at different maternal age, concluded that FGR can occur at any age, and this may be owing to a wide variety of the etiology. The mean parity for women in the sildenafil and placebo groups showed no significant difference in our present work. Parallel to the current study, von Dadelszen et al. found no effect of parity in FGR babies; moreover, Dastjerdi et al. denied the effect of parity on generation in late pregnancy in their study. We have found in our study that 51.9% of patients were associated with preeclampsia, and this may be because of the same pathology of uteroplacental vascular bed, but our study was not sufficiently powered to demonstrate the effect of sildenafil within these groups; this is because we used a single dose, and our conclusions are limited by the inclusion criteria and severity of disease. In our study, 2 h following sildenafil ingestion, two patients expressed headache, four reported flushing, and one had nausea; however, there were no adverse reactions in the placebo group. In our study, the mean of the UA PI, RI, and S/D ratio significantly improved 2 h after sildenafil ingestion as compared with the placebo group. Our findings are in line with Dastjerdi et al. who studied the effect of single dose of 50 mg sildenafil on uteroplacental perfusion in growth-restricted fetuses and showed that the mean of the UA PI and S/D ratio significantly decreased 2 h after ingestion of the same dose of sildenafil as compared with the placebo group. Blumenfeld  suggested that SC used as a therapeutic agent might improve myometrial perfusion in IUGR gestations by promoting myometrial small artery vasodilatation, decreasing peripheral resistance, and increasing flow within the uteroplacental bed. Each participant received 25 mg tablet of Viagra (SC) orally. The uteroplacental perfusion was measured using transvaginal and transabdominal US Doppler velocimetry studies, before and after 2, 4, and 24 h of Viagra ingestion. If no significant adverse effects were recorded, the protocol was repeated 48 h after the first tablet ingestion. He concluded that the effects of Viagra on uterine blood flow changes during pregnancy, and possible changes in other systems were contributed to normal fetal growth and development. In contrary to the findings of our study, Samangaya et al. , in Mary's Hospital, tested the effect of SC at doses of 20–80 mg tid on patients with pregnancy complicated with preeclampsia and found that there was no significant changes in UTA PI after 2 weeks of sildenafil ingestion; this can be explained as all their patients were complicated by preeclampsia, and the maternal syndrome of preeclampsia precipitated delivery in 66% of their patients. MCA pulsed Doppler has long constituted the clinical standard for the diagnosis of brain redistribution which may occur in the presence of normal UA Doppler . Up to 15% of terms FGR have a reduced PI in the MCA, and this is associated with poorer per natal outcome . A significant decrease was noted in MCAs PI, RI, and S/D ratio after sildenafil administration compared with placebo group in our study. Dastjerdi et al. work showed that the MCA S/D ratio and PI significantly increased in the sildenafil group as compared with the placebo group. The difference between the study by Dastjerdi et al. and our study results from the apparent poor Doppler indices and the effect of brain-sparing phenomenon on MCA in our studied patients. This is why we included UTA Doppler indices in our study, which show significant improvement in the PI and RI 2 h after sildenafil ingestion as compared with the placebo group. In contrary to our study, Samangaya et al. tested the effect of SC at doses of 20–80 mg tid on patients with pregnancy complicated by preeclampsia; the results of this study do not support the use of sildenafil with this dose regime in women with established preeclampsia at 24–34 weeks of gestation. Lakhkar et al. studied 58 singleton pregnancies beyond 30 weeks of gestation complicated by IUGR and severe preeclampsia or both, and they were prospectively examined with Doppler US of the UA, MCA, UV, and inferior vena cava. They concluded that S/D ratio of MCA/UA is the most sensitive and specific index in predicting major perinatal adverse outcome (83 and 75%), whereas UA S/D ratio is the most sensitive index (66.6%) in predicting any adverse perinatal outcome, i.e., including both major and minor outcomes. MCA PI is the most specific index (90.9%) for predicting any adverse perinatal outcome. A randomized double-blinded and placebo-controlled trial by Dastjerdi et al. examined 41 pregnant women with documented FGR at 24–37 weeks of gestation and evaluated them for the effect of a single dose of SC on uteroplacental circulation by Doppler US of the UA and MCAs. They found that the sildenafil group fetuses demonstrated a significant decrease in S/D ratios [0.60 (SD: 0.40) (95% CI: 0.37–0.84), P = 0.000] and PI (0.12 (SD: 0.15) (95% CI: 0.02–0.22), P = 0.019] for the UA and a significant increase in MCA PI [0.51 (SD: 0.60) (95% CI: 0.16–0.85), P = 0.008]. They concluded that Doppler velocimetry index values reflect decreased placental bed vascular resistance after sildenafil administration. SC can improve fetoplacental perfusion in pregnancies complicated by IUGR, and this potential therapeutic strategy could improve uteroplacental blood flow in pregnancies with FGR. Dilworth et al. hypothesized that SC (Viagra) would not increase fetal growth in a mouse model of FGR, the placental-specific Igf2 knockout mouse, which has altered placental exchange capacity but normal placental blood flow. Fetal weights were increased (by 8%) in mice following maternal SC treatment (0.4 mg/ml) through drinking water. There was also a trend toward increased placental weight in treated mice (P = 0.056). Additionally, 75% of the fetal weights were below the fifth centile, the criterion used to define human FGR, of the nontreated fetal weights; this was reduced to 51% when dams were treated with SC. UA and UV blood flow velocity measures confirmed the lack of an abnormal vascular phenotype in the mouse and were unaffected by SC treatment. C-methylaminoisobutyric acid transfer (measured to assess effects on placental nutrient transporter activity) per gram placenta was unaffected by SC, versus untreated, though total transfer was increased, commensurate with the trend toward larger placentas in this group. They concluded that these data suggest that SC may improve fetal growth even in the absence of an abnormal placental blood flow, potentially affording use in multiple subpopulations of individuals presenting with FGR. Wareing et al. studied the hypothesis of whether myometrial small artery function was aberrant in FGR and whether SC could improve vasodilatation in FGR pregnancies. They dissected small arteries from myometrial biopsies obtained at cesarean section from normal pregnant women (n = 27) or women whose pregnancies were complicated by FGR (n = 12), which were mounted on wire myographs. Vessels were constricted (with arginine vasopressin or U46619) and relaxed (with bradykinin) before and after incubation with a PDE5 inhibitor SC. They found in their work that increased myometrial small artery vasoconstriction and decreased endothelium-dependent vasodilatation in vessels from women whose pregnancies were complicated by FGR. SC significantly reduced vasoconstriction and significantly improved relaxation of FGR small arteries. Finally, they concluded that SC improves endothelial function of myometrial vessels from women whose pregnancies are complicated by IUGR. SC may offer a potential therapeutic strategy to improve uteroplacental blood flow in FGR pregnancies. Trapani et al. , designed a prospective study of 35 singleton pregnancies (GA range: 24–31 weeks) with FGR and abnormal uterine and UA Doppler waveforms. They compared maternal arterial BP as well as Z-scores for the PI of the uterine, UA, and fetal MCAs before and after application of either a transdermal nitroglycerin patch (average dose: 0.4 mg/h), oral SC (50 mg), and placebo. They found there was a significant decrease in UTA PI with both glyceryl trinitrate (GTN) (21.3%) and SC (20.2%). A significant reduction in UA PI was also observed for both GTN (19.2%) and SC (18.4%). No difference in Doppler PI was observed for UTAs and UAs when GTN and sildenafil groups were compared. No Doppler velocimetry changes were observed for the placebo group. No significant change in MCA PI was observed in any of the groups. Maternal arterial BP decreased with both GTN and SC. They concluded that the use of transdermal nitroglycerin or SC in patients with IUGR is associated with a significant reduction UTA and UA Doppler PI, as well as of maternal arterial BP. Neither drug affected MCA Doppler PI. To achieve optimal fetal growth, adequate blood flow in utero placental vascular function is essential. Many authors have implicated abnormal vasculature adaptation, resulting in aberrant blood flow, as a possible cause of FGR. SC, as a vasodilator, has also emerged as a potential management option in the treatment of FGR by normalization of fetal Doppler velocimetric profile. More controlled randomized trials are needed to investigate the effect of sildenafil and other vasodilators over a long period of pregnancy to support the use of sildenafil to be one of the standard lines in management and to improve perinatal morbidity and mortality in FGR pregnancy. Lang U, Baker RS, Braems G, Zygmunt M, Kunzel W, Clark KE. Uterine blood flow: a determinant of fetal growth. Eur J Obstet Gynecol 2003; 110 (Suppl 1):S55–S61. Petersen SG, Wong SF, Urs P, Gray PH, Gardener GJ. Early onset, severe fetal growth restriction with absent or reversed end-diastolic flow velocity waveform in the umbilical artery: perinatal and long-term outcomes. Aust NZ J Obstet Gynaecol 2009; 49:45–51. Baschat AA. Doppler application in the delivery timing of the preterm growth-restricted fetus: another step in the right direction. Ultrasound Obstet Gynecol 2004; 23:111–118. Wareing M, Myers JE, O'Hara M, Baker PN. Sildenafil citrate (Viagra) enhances vasodilatation in fetal growth restriction. J Clin Endocrinol Metab 2005; 90:2550–2555. Zoma WD, Baker RS, Clark KE. Effects of combined use of sildenafil citrate (Viagra) and 17 beta-estradiol on ovine coronary and uterine hemodynamics. Am J Obstet Gynecol 2004; 190:1291–1297. Panda, S, Das, A, Md Nowroz, H. Sildenafil citrate in fetal growth restriction. J Reprod Infertil 2014; 15:168–169. Dilworth MR, Andersson I, Renshall LJ, Cowley E, Baker P, Greenwood S, et al. Sildenafil citrate increases fetal weight in a mouse model of fetal growth restriction with a normal vascular phenotype. PLoS One 2013; 8 (10):77748. Dastjerdi MV, Hosseini S, Bayani L. Sildenafil citrate and uteroplacental perfusion in fetal growth restriction. J Res Med Sci 2012; 17:632–636. Jennifer MS, Chris B. Effects of sildenafil on maternal hemodynamics and fetal growth in normal rat pregnancy. Am J Physiol Regul Integr Comp Physiol 2010; 298:R433–R438. Salomon LJ, Duyme M, Crequat J, et al. French fetal biometry: reference equations and comparison with other charts. Ultrasound in Obstetrics and Gynecology. 2006;28(2):193–8. Society for Maternal-Fetal Medicine Publications Committee, Berkley E, Chauhan SP, Abuhamad A. Doppler assessment of the fetus with intrauterine growth restriction. Am J Obstet Gynecol 2012; 206:300–308. Bahado-Singh RO, Kovanci E, Jeffres A, Oz U, Deren O, Copel J, Mari G. The Doppler cerebroplacental ratio and perinatal outcome in intrauterine growth restriction. Am J Obstet Gynecol 1999; 180:750–756. Odibo AO, Riddick C, Pare E, Stamilio DM, Macones GA. Cerebroplacental Doppler ratio and adverse perinatal outcomes in intrauterine growth restriction evaluating the impact of using gestational age-specific. J Ultrasound Med 2005; 24:1223–1228. Brar HS, Rutherford SE. Classification of intrauterine growth retardation. Semin Perinatol 1988; 12:2–10. Yanney M, Marlow N. Paediatric consequences of fetal growth restriction. Semi Fetal Neonatal Med 2004; 9:411–418. Von Dadelszen P, Dwinnell S, Magee LA, Carleton BC, Gruslin A, Lee B, et al. Sildenafil citrate therapy for severe early-onset intrauterine growth restriction. BJOG 2011; 118:624–628. Blumenfeld Z. Viagra for the treatment of IUGR. ClinicalTrials.gov Identifier NCT00347867; 2006. Samangaya RA, Mires G, Shennan A, Skillern L, Howe D, McLeod A, Baker PN. A randomized, double-blinded, placebo-controlled study of the phosphodiesterase type 5 inhibitor sildenafil for the treatment of preeclampsia. Hypertens Pregnancy 2009; 28:369–382. Hershkovitz D, Wrong L, Bahativa V. Fetal programming of kidney disease. Clin J Am Soc Nephrol 2007; 2:334–342. Cruz-Martinez R, Figueras F, Hernandez-Andrade E, Oros D, Gratacos E. Fetal brain Doppler to predict cesarean delivery for nonreassuring fetal status in term small-for-gestational-age fetuses. Obstet Gynecol 2011; 117:618–626. Lakhkar BN, Rajagopal KV, Gourisankar PT. Doppler prediction of adverse perinatal outcome in PIH and IUGR. Indian J Radiol Imaging 2006; 16:109–116. Wareing M, Myers JE, O'Hara M, Baker PN. 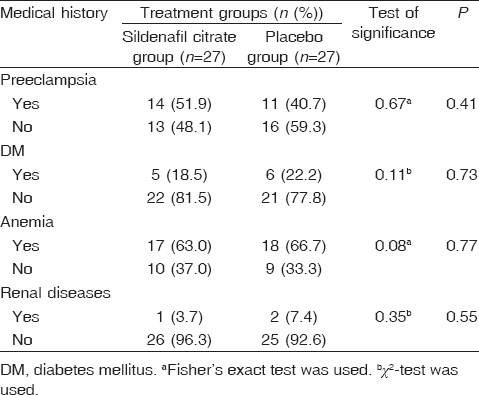 Sildenafil citrate (Viagra) enhances vasodilatation in fetal growth restriction. J Clin Endocrinol Metab 2013; 123:23–28. Trapani A Jr, Gonçalves LF, Trapani TF, Franco MJ, Galluzzo RN, de Souza Pires MM. Comparison between transdermal nitroglycerin and sildenafil citrate in intrauterine growth restriction: effect on uterine, umbilical and fetal middle cerebral artery pulsatility index. Ultrasound Obstet Gynecol 2015; 38:389–394.